How we are managing our gardens affects the health of the soil, air, water and habitat for native wildlife - as well as the human community. Following are some sustainable gardening techniques that you can use to help conserve resources and wildlife. They are easier to care for as they have adapted to your climate and soil. They help reduce air pollution by sequesting or removing carbon from the air. The can save you money by producing organic food. 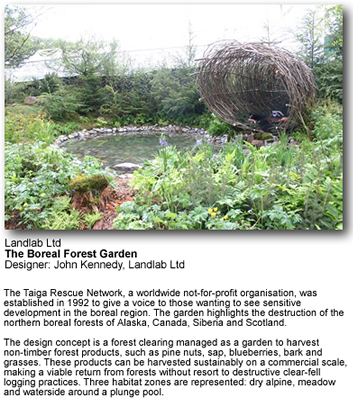 Please refer to: Forest Gardens - The Garden of the Future? Mulch helps keep water in the soil and available to the plant, rather than evaporating into the air. This can help you reduce your watering time. Also, as mulch breaks down, it provides nutrients to the soil. This can help reduce the need for fertilizer. Lawns often require chemicals and if you used a gas-powered lawnmower, the engines in these machines are often very polluting. Since lawns are often made of only a few types of plants, they do not provide a lot of value for wildlife who benefit in ecosystems with diverse plants. Xeriscaping is an approach to landscaping that minimizes outdoor water use while maintaining soil integrity through the use of native, drought-tolerant plants. Rain barrels are used to collect rainwater for use during dry months. Besides helping the environment, an obvious reason for harvesting rainwater is to save money. Depending on the size of your house and the amount of rainfall in your area, you can collect a substantial amount of rainwater with a simple system.